By the time he made City Lights (1931), Charles Chaplin was the undisputed master of the silent film comedy, having achieved just the right mix of “laughter and tears,” or “comedy and dreadful pathos,” as Gary Giddins’ liner notes for the Criterion Collection edition points out. This film epitomizes the filmmaker at the top of his game as he effortlessly blended physical comedy with dramatic moments. His prior film, The Circus (1928), was a hit with audiences, but technology was changing with the introduction of sound in film, or talkies as they were known. Chaplin hated this innovation as he knew it would mean the end of the kind of cinema he had perfected. If City Lights was to be his swan song, he’d go out in style, bringing back his much beloved Tramp character. The film was a massive critical and commercial success – a masterpiece in its own right. 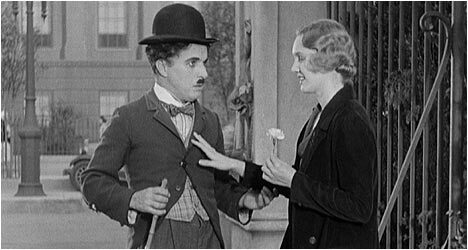 Chaplin’s Tramp becomes smitten with a beautiful young blind woman (Cherrill) who sells flowers on the street and mistakes him for a millionaire. The Tramp was something of a loveable loser that Chaplin used to satirize authority figures and this is evident early on when his character prevents a rich man from committing suicide. He befriends the man and proceeds to get the Tramp drunk. As a result, he runs amok in a classy nightclub by getting into a fight and dancing with another man’s wife. Chaplin’s gift for comedy cannot be overstated enough. From small things, like chewing on noodles and accidentally (and unwittingly) eating party streamers, to more ambitious bits like riding in a car with a drunk driver, he was incredibly adept at physical comedy. Although Chaplin would go on to produce other cinematic classic like Modern Times (1936) and The Great Dictator (1940), City Lights remains a pivotal film in his career – a turning point in the sense that cinema was changing. He had to embrace it to a certain degree or become obsolete. Like any great filmmaker, he did, but on his own terms. The end result is a brilliant film. The Blu-Ray upgrade transfer is fantastic and should please most Chapin purists. The filmic texture of the film is preserved and detail looks fantastic. City Lights looks great. There is an audio commentary by Chaplin biographer Jeffrey Vance. He calls City Lights, “an act of defiance,” in the sense that it flew in the face of talkies, openly rejecting them in the opening scene. Vance explores Chaplin’s misgivings for sound in cinema. He also provides a solid mix of filming anecdotes, biographical details and analysis of the film’s style and its themes. “Chaplin Studios: Creative Freedom by Design” features visual effects expert Craig Barron talking about the aspect of set design in Chaplin’s films and how having his own studio allowed the filmmaker to create incredible sets. They were meticulously designed to aid Chaplin’s goals. “From the Set of City Lights” features behind-the-scenes home movie footage (with audio commentary by Chaplin historian Hooman Mehran), outtakes from the opening scene, rehearsal footage, and a costume test for an unfilmed sequence that provides fascinating insight into Chaplin’s working methods. “Chaplin the Boxer” includes a 10-minute excerpt from the Chaplin short film The Champion (1915), which anticipates the boxing sequence in City Lights. There is also footage of Chaplin meeting with famous boxers back in 1918. Finally, there is a collection of trailers from the U.S., France and Germany.